In dating terms Marvel's Seige, with it's daily teasers, would by now have developed one hell of a reputation. 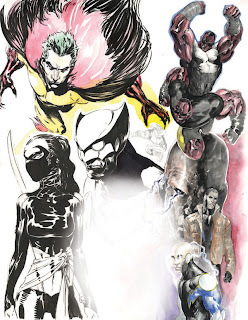 DC's The Outsiders by comparison, still has some modesty left, teasing just enough on the DC Source Blog to whip fans into a frenzy about the upcoming run of writer/Editor-In-Chief Dan Didio and artist Philip Tan. The latest I'm chucking up here as well because let's face it - it deserves a second look. A sketchpage of Tan's showing a few character studies, including rocking new looks for Katanna and Black Lightning. Check out the changing of the guard for yourself when Outsiders #26 hits stands in January.